It’s no surprise that Ervin Santana was tabbed to start Tuesday’s wild-card game for the Minnesota Twins. He had one of the best seasons for a Twins pitcher in recent memory. Santana finished first in the American League in complete games (5) and shutouts (3), second in innings pitched (211 1/3), sixth in ERA (3.28) and WHIP (1.126), seventh in wins (16) and eighth in WAR for pitchers (4.3). Digital Extra: Is the Twins’ Byron Buxton putting it all together in 2019? How rare has it been for a Minnesota starting pitcher to post numbers like that? Well, it’s been since another Santana pitched for the Twins — Johan. Since 1961 — when the Twins began playing in Minnesota — this is just the 50th time it has been accomplished. Amazingly, it was done once by a reliever — in 1976, Bill Campbell pitched in 167 2/3 innings with no starts. Ervin Santana is the 25th to accomplish the feat. Among those who did it multiple times: Bert Blyleven (6), Dave Boswell (3), Mudcat Grant (3), Jim Kaat (6), Jim Perry (4), Johan Santana (3) and Frank Viola (3). In the expansion/steroid era (we’ll call it 1991), a Twins pitcher has had an ERA of 3.30 or lower just eight times. Even more impressive this year was Ervin Santana’s WHIP (walks + hits / innings pitched). 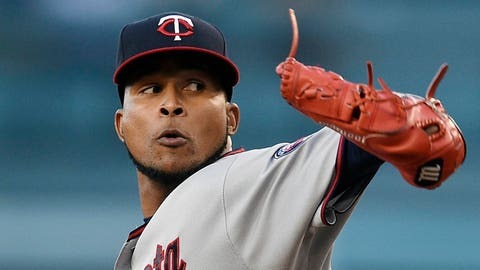 Among pitchers who qualified for the ERA title, Santana was just the 10th Twins pitcher to have a 1.126 WHIP or better in Minnesota history. Overall, it was the 19th time to occur. In addition, his .225 opponent batting average was eighth-best among the 19 — three of the top eight occurred in the 1960s, including one in 1968, which has been dubbed the year of the pitcher (only one American League player hit above .300 that season — Carl Yastrzemski at .301). Only the Santanas — Johan and Ervin — have posted WHIPs as good as 1.126 since 1993. No matter what happens Tuesday, 2017 was definitely a special season for Ervin Santana and Twins pitching history.